This Horseshoe Game can be played inside or outside. If you are playing inside, two pegs are used to hold the mats in place. If you are playing outside, the sturdy plastic stakes can be used to firmly plant the rubber mats against the ground. 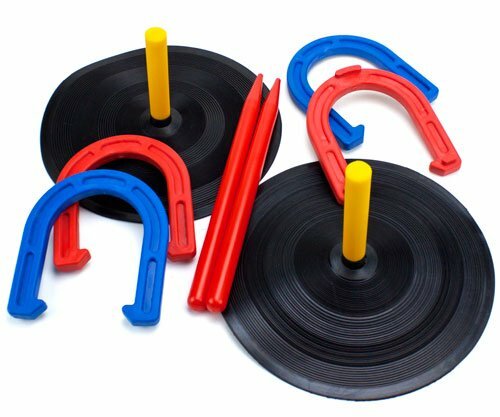 Horseshoes is a great game to take on camping trips, picnics and more. To set up the game outside, stakes should be driven into the ground about 40' apart and angled slightly towards each other. The stakes should stick out of the ground about 12". If you are playing inside, set the two plastic pegs about 40' apart on a smooth surface. When tossing horseshoes, the National Horseshoe Pitchers Association states that the foul line should be 27-37 feet away from the stake.